This is a perfect product if you want to keep your litter box hidden from the visitors. Plus, it is good for your cat, if she likes her privacy. I have a cat who is very shy and does not feel comfortable with the open litter boxes. So I got this for her. And she just loved it. Whenever she felt the need, she would just pop in and nobody would ever need to know. There was no more of shying around, and we were also happy. What I like about Good Pet Stuff Hidden Litter Box is that it does not look even a little bit like a litter box. It is camouflaged in an ornamental planter. There is a back door entry via s cutout door from where cats can enter very easily. This special product has a Phoenix plant along with a florist moss topping. Assembling a cat litter box was never so easy. First of all, put a plant in the receptacle that is situated on the top section of the of the planter. Fill the base with any litter to the depth as given in the manual or as instructed. Attach the top to the base. Line the entrance hole for that. Place the filter around the base of the plants. Aim to give it a finished look. Arrange the plant anyway you want. Just make it attractive. To clean, take off the top section. Keep it aside. Now, using a litter scoop, clean all the litter. Or you can replace the litter also. Again, replace the top of the box by lining the entrance home. You can clean the body using soap and water. Trust me ladies, this adds to the beauty of the home. Plus you get a decorative piece of item and a cat litter box at the price of one. The plastic construction means that it will last for years. Also, it is super easy to assemble and clean. To remove the odor, all you need is some vinegar. Sprinkle it onto the surface and rinse with warm water. 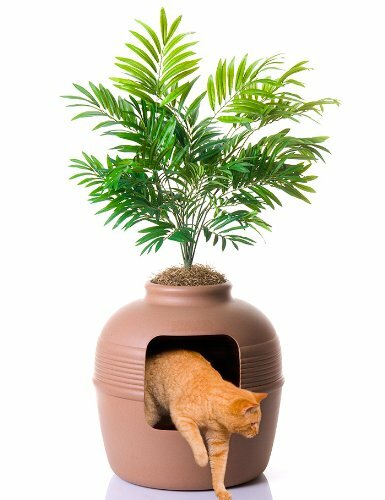 Just remove the top to empty the litter box and wipe the planter. Cleaning is a little clumsy if you are accustomed to automatic ones. Do You Face The Problem of Spraying with Your Neutered Cat?